DUBAI, UAE, Jan. 8, 2018 — Following the introduction of the company’s robot lineup a year ago, LG Electronics (LG) continues to push the envelope with the unveiling of three more work robots at CES 2018. 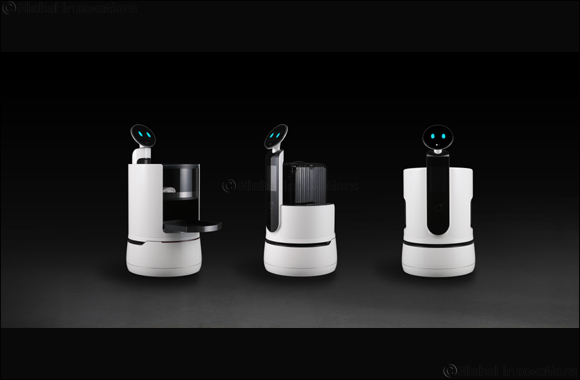 LG is introducing three new concept robots spe-cifically developed for commercial use at hotels, airports and supermarkets. These new robots represent LG’s commitment to expanding its business into a future growth engine based on its leading robotics technology. All part of LG’s new CLOi (pronounced KLOH-ee) robot brand, the Serving Robot, Porter Robot and Shopping Cart Robot follow in the footsteps of the Airport Guide Ro-bot and the Airport Cleaning Robot that recently completed successful trial runs at Ko-rea’s Incheon International Airport. The Lawn Mowing Robot and the affable Hub Ro-bot, which recently participated in a trial at one of Korea’s largest financial institutions providing information and servicing customers at the bank’s branches, are also part of the CLOi family. The purpose of the Serving Robot is to deliver meals and drinks to guests and customers at hotels and airport lounges quickly and efficiently. The robot can deliver food or re-freshments around the clock and with its built-in sliding tray, present the tray to the cus-tomer for easy removal. Once the delivery is confirmed, the Serving Robot makes its way back on its own. Designed to deliver luggage to the guests’ rooms, the Porter Robot minimizes the in-convenience that may result from slow service and long wait times during a hotel stay. The Porter Robot can also handle express check-in and check-out service and take care of payment, allowing busy guests to check out and have their luggage delivered to a waiting car in a fraction of the time. LG is also applying its robotics know-how to improve the shopping experience at pre-mium supermarkets. With the help of LG’s Shopping Cart Robot, customers can scan items using a barcode reader on the robot to view product prices and see their complete shopping list on the face display. The robot can also guide shoppers to the products they select on a smartphone app. LG’s CLOi robots will be developed in parallel to ThinQ products, LG’s AI brand for consumer electronics and home appliances. LG CLOi is LG’s brand designed to deliver both emotional interaction and innovative convenience to customers utilizing AI tech-nology.